Although I have tried to make this a monthly newsletter, business demands have made it impossible for me to keep up. I do apologize and will strive to continue this ezine at least every other month. As a way of saying thank you for your interest in our ezine, we are offering a chance to win a rectangular plant stand. No purchase is necessary. We shall select one email address on June 1st for our winner. Just put "ENTER" in the comment section of the contact form. That is all there is to it. We shall announce the winner in next month's ezine. 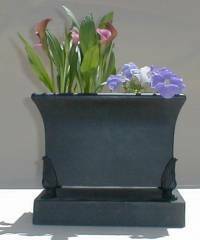 Click here to send us an email to be entered into a drawing for a free planter stand. We are relieved to announce that our former exchange student from Madrid, Spain, Eduardo Delgado and his whole family are OK after the train bombings last month in Madrid. We have spotlighted one of our employee/owners in each of the past newsletters. This month we want to feature Angel. Angel is from Peru and has been welding for more years that he wants to remember. 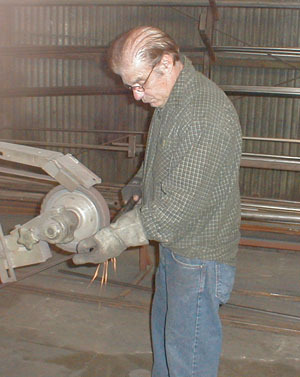 Here Angel is grinding a part to fit into the jig prior to welding. We wanted a picture of him without his welding helmet so that you can see him. Angel takes pride in his wife of over 40 years and his grown daughter. He likes to spend his spare time gardening and taking care of his rental properties. He also loves to regale us of the beauty of the country he left so long ago. This month I will start by stressing that although the business climate has been rough, especially for American manufacturers, we here at Barstools4u.com have made a commitment to keep our production here in Los Angeles. Although we are forced to import some of the components, (there is no table top glass made in America for instance), we will not become an importer of furniture and ship our jobs overseas. We have added some new barstools to the line. Some of them are of our own unique design and some are variations of product coming in from Asia and Mexico. We are very proud of the fact that although we are offering similar product being produced abroad, we are offering the product at a lower price and higher quality than the imports. We are especially proud of our new 903 series stools, offered in swivel and stationary models. This stool has forced us to expand our capacity into doing sheet metal which is something we never tried before. That has allowed us to personalize the line as we purchased a plasma cutter and can write your name on your furniture. You can see the B 4 U on the back of our sample stool. You may click on either of the above two images to see the new product. As I try to make this newsletter something other than a puff piece about Barstools4u.com, I do search the web for interesting articles and web sites that should hold interest for our readers. As I build barstools, I found a web site that offers plans for guess what? Home bars that you can build yourself. How is that for a beautiful homemade bar? Check them out at http://www.lazzell.com I am sure that you will find the site as interesting as I did. As the weather turns into spring (it is a wonderful 93 degrees here in South Pasadena, California as I am writing this) our thoughts turn to the garden. Check out our unique Cat's Paw planters Click on the photo for a link to our accessories page. And if you decide to order any accessory during the month of May 2004, just write May04 on the comment page of the order form and we shall take 10% off of our already low factory direct prices. And for something to put into the planter, check out this nursery web site. http://www.gardensalive.com You may invite me over to try the salad when you are finished growing it with the great products that they offer.